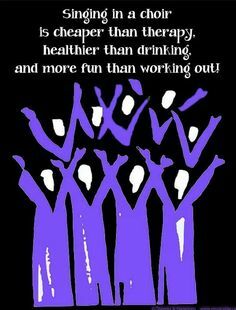 Benefits of Singing in a Choir - Greenfield Community Choir, Inc.
"Why should I sing in a choir?" you might ask. "I sing in the shower and in the car. Isn't that enough?" Well, yes and no. Singing in the shower and in the car can be great if done well, but singing in a choir gives you benefits -- both physical and emotional -- that singing alone can't. The article below lists some of the many advantages that you get when you join your voices with others to create beautiful music. Learning to negotiate very long passages in one breath can be very good for the lungs. We learn to inhale deeper, thus filling every nook and cranny of our breathing apparatus. It is very important to really pump up the lungs, so the experts say. Personally I notice singers breathe remarkably slower than the non-singers. I really did some watching and realized that the breathing exercises can really enhance the way one uses the organ. In fact, it is encouraged to breathe deeply and slowly. It can be learned actually and become an acquired habit. It is indeed good for you. We get in better shape. As choristers, we find it very vital to sit and stand properly. For sure, your choir conductor had encouraged you to acquire the habit. And if you are one to most likely heed his advice, you can be observed to stand more impressively, sit without slouching, and walk elegantly-all images of health and confidence. If only for these things, choir is worth all the trouble. We elevate our singing prowess. As days and months pass, we notice development in our singing proficiency. Non-singers tend to tire up easily as they sing. Notice also that they frequently "trip over" the fast songs, they occasionally cough here and there, or altogether stop in the middle of singing. The singers, having been exposed to varying speeds of songs, reading music and lyrics at the same time, build up stamina and cope up more easily than the average individual. On top of that, did you notice that singers have a more commanding voice and a more polished vocabulary? Once in a while, one needs to express himself and "de-stress", especially after spending a week in front of a monitor, or of scanning heaps of prescribed school reading, or simply for sitting through hours of traffic on the way to school or work. We need to "let off steam," but of course, in a positive way. Singing out loud in the vocalization routines is good enough. And songs, having "peaks of emotion" at one or two places will bring the singer to an elevated sphere where he somehow finds release from the gathering burnout. We get to cultivate an intimate circle of friends or "family". As we huddle, and labor, and perform together, asking and giving each other support and know-how, we get attached to each other on a deeper level. Thus, meaningful relationships (no pun intended, really) result. It is very much anticipated that everyone eventually opens up to one another, thus, breaking the walls of animosity and self-consciousness. Together we accomplish a goal -- blending our voices together to create beautiful music. Everyone's voice is different. When we are in a choir, we are given the task of taking each of our individual voices and blending them together to create a beautiful sound. This requires us to listen and work together, two things that will benefit us in all aspects of our lives. We go through the week with a new song in our heart. I remember an officemate from way, way back. She sang and hummed all day long as she breezed through her work. She was a Christian, after all, and a singer in her church choir. She brought the sunshine into our otherwise drab office that we happened to work in. There was an innate smile to her countenance. Ask any choir member what makes him/her remain in the singing ministry. Most likely, many of them will cite the spiritual benefits they gain. "It's a great thing to serve the Lord, walking in the light of God." So goes one famous praise and worship song. It is a booster actually. Knowing in your heart that somehow you have given back to the Lord something out of His many blessings to you. Finally, being able to perform in front of people develops stage presence. This can be very useful in one's performance at school or in the workplace. We don't just need "stage presence" on a stage. It's a way of presenting everything we do with confidence. It's the way we walk; it's the way we stand; it's the way we speak to others; it's the way we look. It's the very way that we carry ourselves through our everyday life. With all of these great advantages, why are you waiting? Get out there and join a choir! It's the best thing that you can do for yourself! ... that choral singers are better citizens? Research shows that choral singers are more likely to vote, give money to philanthropies, and also to volunteer. They're the kind of people you want on your team. ... singing in a choir is a popular thing to do? Choral singers are in enormous numbers in the U.S. Some 32.5 million adults sing in 270,000 choruses. ... that singing together can calm your heart? Research has shown that when singers sing together, their heart rates goes down. The most amazing thing this research found, though, was that it didn't take long for the singers' heart rates to become synchronized. Singing in a choir is definitely fun, but did you know that it can also be good for your health? 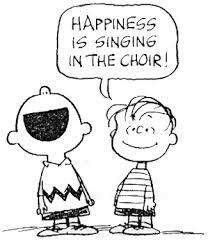 Read on, and you will discover all the great things that singing in a choir can do for you!